You are going to be dreaming of a beach vacation after seeing this incredible Bald Head Island beach house! 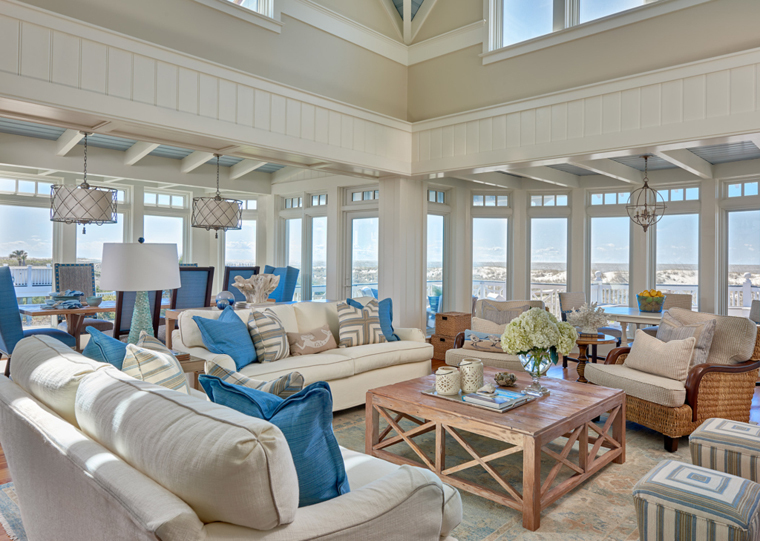 Interior designers Vicky Serany and Julia Ross from Southern Studio Interior Design, an award-winning interior design firm out of Cary, North Carolina, filled the home with a serene color palette of breezy blues and sandy hues inspired by the jaw-dropping views outside every window. The designers worked with architect Cothran Harris and builder Parker Dudley on the renovation, taking great care to honor the home?s history and architecture. The gorgeous architectural elements, impressive woodwork and charming details only add to the sophisticated yet laid-back vibe of the vacation home. Keep scrolling for more beautiful photos by Dustin Peck…. Love the dutch door and custom Ro Sham Beaux beaded chandelier. The ceilings in this home are breathtaking! Can you imagine waking up to that view of the Atlantic ocean"! The built-in twin bed on top of the existing bed is genius! Check out the ladder…. The custom bunk beds are just as stunning as the ocean view! It doesn’t get any dreamier than this! To read an article all about the renovation of the home, visit Home Design & Decor. And for lots more inspiration and eye candy from Southern Studio Interior Design, check out their portfolio, blog and Instagram!